A New Megagame Approaches for PAX East 2017! 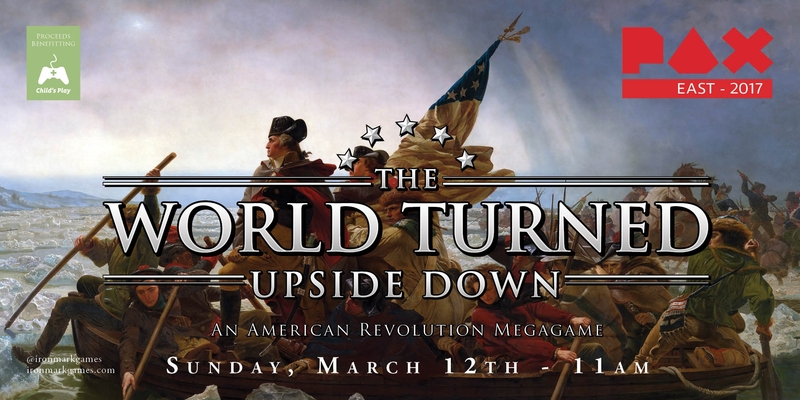 We are VERY excited to be bringing The World Turned Upside Down at PAX East 2017! We’ll be taking pre-registration over at twtud.eventbrite.com where ticket proceeds will go to benefit Child’s Play Charity! For those of you who want to play but can't buy in advance, signups will be first come first serve starting at 10 AM on Friday, March 10th in Tabletop HQ. Players do not need to pay to signup at the con though a friendly donation to Child’s Play is greatly appreciated.  A list of playable characters and more details on the game can be found here. New to megagames? Find out more about them here! I am so excited for a new theme! Rule, Britannia! Britannia, rule the waves! *Slightly NSFW [phallic imagery and mild language]* If some gets to play Washington/he is in the game, I would love for him to be introduced with this song in the background: George Washington. IQuestion- will the game be accessible for visually impaired? My guide doesn't want to play and would be separating but I love megagames. I have some sight and can read text if large enough. I cannot distinguish people on sight unless they're very distinct (i.e. a bright orange jacket). Hey divisionten, I sent you a PM. Shoot me an email and we can discuss further. If you've played megagames before I sense that this game will be ok, but I'd like to chat with you further to be sure we're doing everything we can. megagames are so much fun! i really appreciate that the price is down this year. i just have to figure out if it's worth blocking off nearly all of sunday to do it... SO TEMPTED. Oh who am I kidding, I'm totally signing up for this. Let's raise a glass FOR THE REVOLUTION! hey, are we getting an email soon with the info? i'd love to chat with whoever my teammates are, read the rules, etc. we're only a few days away from boston! Hey ilta! Manuals should have gone out very recently. Team emails are starting up right now. If you don't see them tomorrow send me a message. I got mine! Thanks! Looking forward to it.